Hello everyone and TechnoGiants hope all the readers are doing well. This time TechnoGiants and iSkysoft together comes up to organize a NEW giveaway of iSkysoft PDF Editor. All of the TechnoGiants users can get a chance to win the genuine license of iSkysoft PDF Editor ver 4.0 worth $69.95, 5 lucky winners will get 1 License Code each for a Year of the software, so give your comment and participate in giveaway. PDF editor is the most usable software to let you edit your PDF file and can add up things in it and it can be used in all kind of professions by different professional’s. Well, now here’s an awesome and most popular software for the people who want to own such software. The giant iSkySoft brought software named, PDF Editor for you and this software has numerous features such as add, delete, modify elements like text, images, graphics, and even links in PDF file. Furthermore, it can easily turn your PDF file to Microsoft documents like PowerPoint, Word and Excel and you can also convert your PDF files to Image. You have full control on PDF pages such as move, insert, delete, extract, crop and rotate as in user interface part and it can be mark and annotate PDF documents with an array of tools. iSkysoft PDF Editor for Windows enables you to edit PDF document easily in a same way as you can edit MS Word and iSkysoft PDF Editor tools are very easy to access. Users can make PDF documents from existing files like Word, Excel or PowerPoint. iSkysoft PDF Editor has all the ability to remove any unwanted pages, rate pages, or insert new pages, images and graphics. Simply click to edit any added image or adjust the size. Users can not only create PDF files but can also merge PDFs easily with the inbuilt feature provided by iSkysoft PDF Editor in just one click. One can drag and drop files for editing. We can even split the files into many pages. This can be based on the number of pages we set. It enables you to secure your confidential PDF documents with password to prevent from opening, editing, copying or printing. What’s more, this powerful editor has the ability to decrypt any password protected PDF document. This is one of the best features ever provided by the software. This app enables the editor to add a raise and extra comments in the document with ease. For the process of markup and annotation, the app provides for tools like highlight, underline, strikethrough, sticky note, text boxes, rectangles, and clouds. You can also easily edit and convert scanned PDF files by using leading-edge OCR technology and Convert your scanned PDF files to Word, Excel, PPT, EPUB, HTML and Texts. Isn’t it amazing guys? User can easily edit PDF documents in a same way as you edit MS Word documents. All tools of this product are very easy to access, like adding and deleting text, images and links. It also allows you to convert PDF files to Word, Excel, PowerPoint, Image and more. iSkysoft PDF Editor provides Windows version and also Mac version of this software. One can use this software with either of the Operating systems and do the necessary PDF editing. 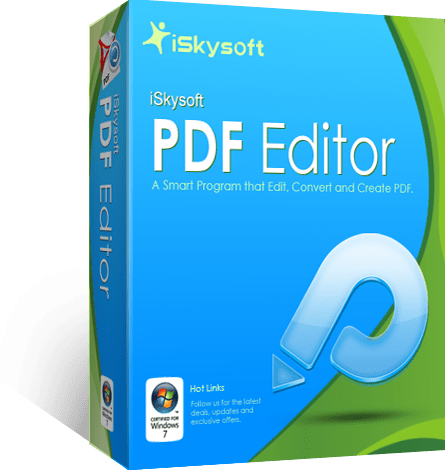 iSkysoft PDF Editor version 4.0 license code normally charges $69.95 but thanks to Becky from iSkysoft, who is giving a chance to win 1 Year License Code for all the TechnoGiants readers but finally there will be 5 winners only. The giveaway campaign runs from July 15th, 2014 – July 30th, 2014 and all you have to do is to follow the giving below rules to participate in this giveaway. [Update Widget Removed] Winners announced HERE. Yeah, it’s really a wonderful app and works like a charm. Thanks for joining the giveaway. I hope you have already enter your entries on the PunchTab.